The 2012 Rebel remains North’s flagship kite, combining all the ingredients you need to cover a huge wind-range, rip apart any size surf, boost huge airs and ride comfortably in nearly all conditions. It is quite simply our best interpretation of what a modern free-ride/wave kite should be and it’s really no mystery why the Rebel is THE most sold kite ever. The 2012 Rebel remains a loaded 5th line kite, offering its most acclaimed performance attributes like a short bar stroke, crisp, direct feeling, rock solid stability in all conditions, and it’s unique ability to steer while de-powered. The new square wingtip design maximizes the effective tip area, makes the tips less prone to distortion and fluttering while steering and gives the Rebel its new stylish and modern appeal. Super clean tip panels account for greatly improved, ultra smooth turning and easy handling that remains smooth even in over-powered conditions. Size-specific tuning ensures that the big sizes feel crisp and lively and the small sizes feel forgiving even in blistering wind. The Rebel also features a simple back-line adjustment to tune it for greater or lesser bar pressure to suit your desired feel. 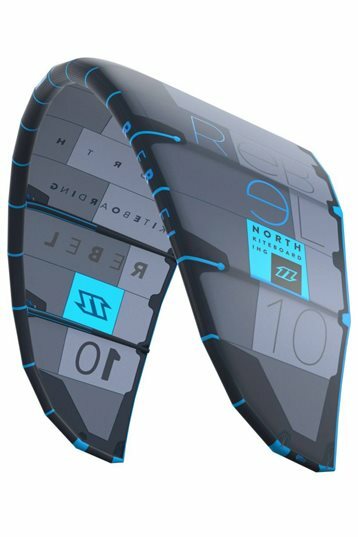 As with all North kites, the 2012 Rebel is built to last utilizing our proven construction methods and the highest quality materials like our exclusive Teijin D2 canopy fabric. The NKB Trust bar 5th Element is the most progressive and effective tool to steer your kite and comes equipped with the most functional safety system in kiting, the IRON HEART IV. The Iron heart IV fulfills the challenging French safety norm and offers the best possible safety even in the most extreme conditions. The release forces are remarkably low, providing the highest level of safety in emergency situations. For 2012, the entire bar has been completely re-designed, without losing proven features like the roto-head, the sliding stopper with stopper ball and adjustable winding posts. The small and lightweight vario cleat helps to adjust the Trust Bar in any situation quickly and easily. The new upgraded ergonomic bar grip improves comfort and all features of the 2012 Trust Bar are redefined with an aim on the highest functionality and easiest handling, even in challenging circumstances. The 2012 Rebel remains North’s flagship kite, combining all the ingredients you need to cover a huge wind-range, rip apart any size surf, boost huge airs and ride comfortably in nearly all conditions. The 2012 Rebel is hard as a rock. Its profile is tight, which you will be able to notice in its flight characteristics: very tight on the bar, direct power and highly stable in the air. The Rebel is a true wing, which is reflected in its old school characteristics. 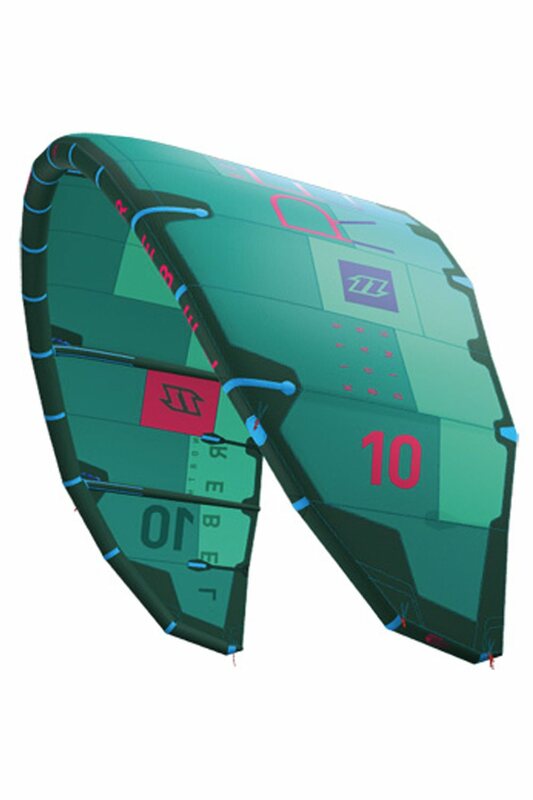 The most notable about this kite is the explosive lift and a truly spectacular gliding phase. The Rebel is a kite that demands a lot of technical skills from its rider. Why? The Rebel has to be flown on high speed. Too much pressure on the steering lines will slow it down, so release and let it fly for power! Riding the edge of your board and kite position both have a big influence on the amount of lift the Rebel provides. The right angle of attack has to be found for an explosive lift, maximum duration of the gliding phase and highest speed possible. The 2012 version of the Rebel has changed compared to its 2011 predecessor. It has a considerably longer gliding phase but is also less playful. Please note that we have tested the 10m version of the Rebel. 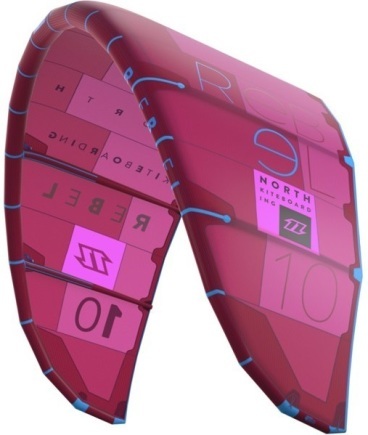 The characteristics of a kite series can vary widely throughout the different kite sizes, and we expect the North Rebel Series to be no exception. We expect for example that the smaller versions will display more wave performance. For wavers, we would advise to test the 8m or 9m variant. 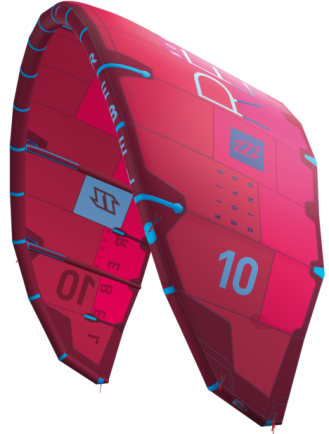 The 10m variant is without a doubt a kite that will be able to surprise every seasoned big air specialist. Tipturn, 10m is a wide kite! Good but above 20 knots the 10m less reaction, take a smaller kite! A very versatile kite, great for the 1st one from low to medium wind range. For stronger wind I prefer a C-shape. Even accidently board edge loosing on jump can cause wraping over 5th line because of slow drift. Beware of great low-end - you can surf in conditions when restarting from deep water is not possible even using the 5th line. Great allround kite. Solid, safe and stable. Great brand, easy to resell as 2nd hand. Also bought some second hand 2009 rebels which are in great shape. Kite relaunch is easy in high winds, in low winds 5th line is needed. Single seam on front tube, not very durable. I ride the Rebel mostly just in the surf although I do occasionally go out on super windy days and boost some big jumps. The Rebel is not the best kite for unhooking and doing wake style tricks, but for everything else it pretty much ticks all the boxes and is my favorite 'go to' kite. It's great for: surfing, jumping and everything free-ride oriented. Things I love about the Rebel: direct feedback, safety, handling, huge range, smooth turning etc. The bar pressure can be adjusted to the hard or soft setting by simply moving a knot on the back line attachment. I prefer the hard setting because it gives me the most direct feedback about where my kite is so that I always feel connected and in tune with what my kite is doing. The softer setting is good for riders who want a slightly less direct feel and softer power development. I have been using my Rebels since April of 2011 (yes I get the first pre-production samples, lucky me) and they are still going strong. The D2 fabric in the canopy (which north uses exclusively) is incredible to say the least. It stays crispy and new way longer than other fabrics and adds so much durability and life span to the kites. If you have never ridden a Rebel then chances are you don't know what you're missing. Get a demo, try it out and see for yourself how good kitesurfing can be. I've chosen the rebel because it's a kite who is almost perfect for the kind off demands i need while i'am riding waves. What kind of riding style do you have in the waves? Strapless?